They needed consistent, constant, limit-setting, loving adults in their lives and activities to stimulate their learning and creativity. So in February of 1994 Nancy decided to come and spend a year developing an enrichment program for the kids. Within a few months of arriving in Guatemala to implement the plan, she knew she would never be able the leave the kids and return to the United States. So she stayed. In October 1995, Nancy experienced another drastic shift. 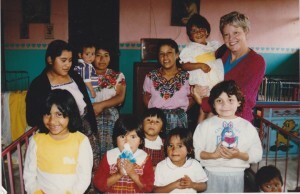 A young man carrying a tiny bundle wrapped in towels arrived at the Guatemalan orphanage where Nancy was volunteering. Thinking it was a loaf or bread, Nancy peeked inside and instead found a baby girl. The baby was four-days old, weighed only four pounds, and was barely clinging to life. Nancy agreed to take the child since the orphanage was not equipped to care for such a fragile child. The doctor told Nancy that the baby was barely alive and would not survive. She took the baby home and fed her with an eyedropper. Within a few days the baby started to come around. 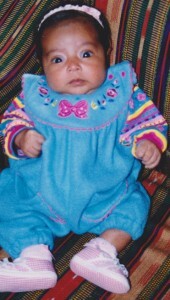 Nancy adopted the baby girl and named her Gabriela (Gaby) Maria. When Nancy was nursing Gaby back to health, she made a promise that she would grow up with lots of brothers and sisters, have a childhood filled with fun, and the support she needed. ​Because of the experiences she had and the commitment she made to Gaby, in 1996 Nancy founded the children’s village Semillas de Amor. The Village is a place where children are loved, nurtured, given proper care, educated, and allowed to blossom. Nancy’s career in the helping profession began when she, as a high school drop out and single mother of two young sons, put herself through college and graduate school. She earned a B.A. in Psychology from the University of California at Santa Cruz and an M.S. in Clinical Psychology at California State University at Hayward. Nancy worked many years counseling drug addicts and alcoholics before going to work as a vice president for a San Francisco based corporation. In 1985 Nancy developed an internal employee assistance program (EAP) for the corporation and under her direction and supervision the department grew to include managed mental health care, health promotion, volunteer programs, pre-retirement services, child/elder care, commute alternatives and other employee services. In 1990, Nancy founded her own business, Employee Health Plus, to provide EAP services externally to a variety of corporations. During Nancy’s tenure as an EAP professional, she was elected to serve on both the national and local EAP professional’s board of directors. Now Nancy is the Executive Director at Semillas de Amor and continues to support the children living there with love, guidance, and values that she hopes will give them the foundation to live a happy, fulfilled, and gratifying life. Today Gaby is an amazing, beautiful, talented, and loving 20-year-old young woman studying biochemistry at Reed College in Portland, Oregon. She is a wonderful role-model for the other children. Gaby is Nancy’s constant reminder of the tremendous potential of the children in Guatemala.